This is my first attempt at imaging planets with an astronomical CCD camera, as opposed to with a webcam or DSLR. Uranus and Neptune are particularly difficult targets, given their tiny apparent sizes (3.7” and 2.3”, respectively). I did a G2V star color calibration, corrected for atmospheric extinction, in order to get as accurate a color balance on Uranus and Neptune as possible. On a decent monitor, the difference in color between those two should be fairly obvious. All in all, given the wrong tool for the job — a CCD with a painfully slow frame rate — and the awful seeing, I'm pretty pleased with the results. 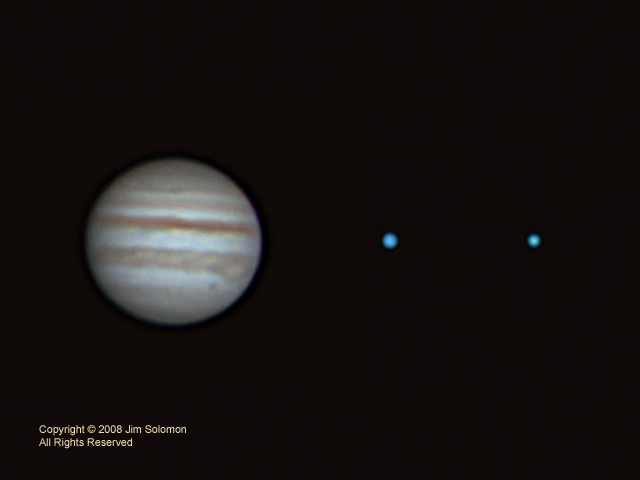 Jupiter was done as a “control” group to make sure I didn't get carried away with wavelet processing. In fact, I used the same wavelet coefficients on all of the individual images. The image is a composite pasted together in Photoshop of the highly cropped, but nonetheless full resolution images. Hover the mouse over the image to see the labels, although such should not be necessary given the highly educated nature of the visitors to my web site! <smile> North is up.